It's always a sad affair when a marriage eventually comes to an end. Having said that, though, is it a sad marriage when an affair suddenly begins? Now to find out what I mean by this, please check out this 108-minute movie made in 1992, Directed by and Starring: Woody Allen; with Judy Davis, Mia Farrow, Juliette Lewis, Liam Neeson, and Sydney Pollack. When the long-standing partners, Jack and Sally (Sydney Pollack and Judy Davis), announce to their long-standing friends, Gabe and Judy (Woody Allen and Mia Farrow), that they are about to part ways, life suddenly seems to spiral completely out of control. Three weeks after their split, Sally finds out that her ex-husband, Jack, has found himself a new lover, called Sam (Lysette Anthony), who is a lot younger than she is by quite a few years. Obviously, this turn up for the books really upsets Sally. But don't you worry, though, folks. Over time she comes to terms with Jacks new state of play thanks to her close friends, Gabe and Judy, and she begins living the single life she always dreamt about. Moreover, when Judy introduces Sally to Mike (Liam Neeson), one of her work colleges, Sally becomes a couple once again. Not that her ex-Husband, Jack, likes the sound of this news either. Still. What can he do about it? Huh? Fight? Scream? Re-Unite? Judy is very disturbed when she hears the sad news that her best friends, Jack and Sally, are separating. In fact, she becomes so disturbed, she subconsciously pushes away her husband, Gabe, whilst at the same time focusing all of her energies in helping out Sally. As for Gabe on the other hand, well, he is upset that his friends have separated. Agreed. Yet at the same time he is also intrigued by one of his pupils, called Rain (Juliette Lewis), who is a very good writer. Now as time passes, both teacher and pupil get to know each other on many different levels. For example, Rain tells Gabe about her attraction to older men, whilst Gabe allows Rain to read his unpublished manuscript, despite Judy eventually leaving him for another man, thus paving the way for him to make a pass at Rain. Alright. I know what you're thinking, folks? So is Gabe successful with his advances towards his pupil? Plus who is Sally new man? Want to find out more? Fair enough. But I'll have to warn you, it's always a question between Husbands and Wives! 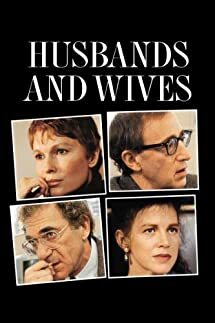 In my most humble opinion, 'Husbands and Wives' is Woody Allen’s answer to the question: ‘Why do some relationships work, whilst other relationships don’t?’. Yeah. I'm not kidding you, pal. This is the type of film that makes you think about the true nature of human relationships, as well as it being a cathartic and revealing project for Woody to cast onto celluloid. And why would it be revealing, you may ask yourself. Well, most of Woody’s films -- especially those made in the eighties and the nineties -- work on a very personal level. It is as though these films are a form of therapy for him. Giving him the opportunity to work out something that is niggling inside his brain. Cerebral, I know. But that’s Woody for you. One half mental. One half jovial. And one half two halves. Here. Just look at the filmic-facts to see what I mean. (1) 'TriStar Pictures' first screened this $20 million dollar production at the 'Toronto Film Festival' on the 14th of September, 1992, and clawed back $10 million dollars at the domestic box office, alone. (2) Most of this movie was shot on location within the American state of New York. This includes, the 68th Street Playhouse, the Dean & Deluca Cafe, plus numerous parts of Soho and Manhattan. (3) Loosely translated, this project was entitled 'Married Couples' in Greece; 'Wives and Real Men' in Sweden; and 'Men and Wives' in Denmark. (4) Generally speaking, the casting for this picture was a somewhat timorous affair. Emily Lloyd was cast and shot some footage as Rain, but eventually she was replaced by Juliette Lewis, when Woody did not like what Emily was doing with her role. Also, Jane Fonda was originally offered the role of Sally, yet ultimately turned it down when she disagreed with Woody's perception of this part. 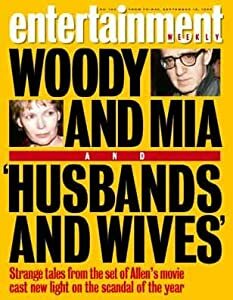 (5) 'Tri-Star' released this movie at the exact same time Woody Allen and Mia Farrow separated, just so they could deliberately cash in on the media coverage surrounding their turbulent divorce. Yes. It worked. Big time. (6) Jeffrey Kurland had two jobs on this film. He was a costume designer first, and he was the narrator second. (7) Woody went on record and said that he thought this was one of the best films he ever made, because he tried to defy all the rules of film-making, by obscuring and tampering with the normal conventions. 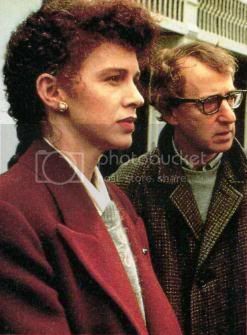 (8) Originally Mia Farrow was going to play Judy Davis' part in this picture, and visa-versa. But because it had an easier work schedule, she wanted to play the part of the cuckolded housewife instead. OK. So where was I? Oh, yeah. What I think about 'Husband and Wives'. Now I'd say from a narrative point of view, this film is less of a satire and more about the theme of the movie in itself -- i.e. relationships, and how they work in practice. Listen. I'm not trying to imply that this film is not funny at all. Because it is. Really funny. And in addition to this, it also has Woody’s trademark fractured plot-line, complemented by the ‘talk to the camera’ question and answer sessions. For me, it's these particular aspects that makes this movie that much more compelling to watch. Not only does it conform to a more direct method of communication, but it also allows for back-story and character to develop at a more understandable rate. Oh! And as for the characters in themselves, all definite 'Woody Allen' archetypes, for sure. With Judy the fidgety female. Sydney the man in a mid-life crisis. Juliette the vixen. Liam the hopeless romantic. Mia the needy homebody. And Woody the Woody (obviously of the more mature statue now). Furthermore, I have to say that they all pull off some very powerful performances in their respective roles -- especially Judy and Juliette -- who just exhume the characters they play like women possessed. On the reverse side of this, though, the down side of this film would have to be that the narrative structure can be somewhat jarring at times. Mainly because the camera work -- even though deliberate -- seems too shaky here and there, and can sometimes be slightly off-putting to follow. Hmmm. Just like marriage I suppose, ha! Nuff said.